Danish National Railways have added a CO2 calculator to their travel planner so when searching for a trip passengers can compare the C02 emissions of the train journey with the equivalent journey undertaken by car. This Google Earth plugin tour follows the route of a train from København (Copenhagen leaving at 08:50 AM) to Aalborg in North Jutland. The tour shows all of the train's stops and an image overlay at each station shows the C02 emissions of the train (green) and a car (red). The tour is accompanied by a song called La Trilogie (Part 1). Since the Google Earth plugin does not fully support all the animation features of Google Earth the tour creator has also created a KMZ file. This Google Earth plugin map from the Vulcan Project shows U.S. fossil fuel CO2 emissions for 2002. 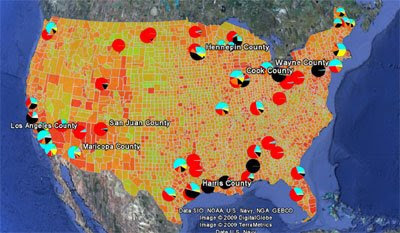 The map holds an incredible amount of data on C02 emissions and the data can be viewed for every county in the country. The emission data can be refined by total CO2, Aircraft, Commercial, Electricity production, Industrial, Nonroad, Onroad, Residential, Power plants and Airports. The map can also be searched by state, county, city / town or zip code.